The Telegraph and 'Greener Journeys' co-hosted a debate recently, examining some of the issues surrounding bus travel, government funding and the vital role the bus plays in mobilising the UK workforce and economy. What role does the bus play in mobilising the workforce? Why should the Government invest in bus and coach travel? 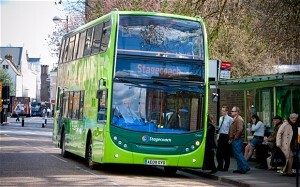 Can the bus reinvigorate the high street? Why do we need the 'Buses and Economic' Growth report? It is encouraging to see the role that buses play being promoted in such a positive way and making the sometimes forgotten point that Buses account for two-thirds of all trips via public transport. The bus industry is a major employer, providing 123,000 jobs in the UK and contributing £2.1bn a year to the economy – half a billion of which is in tax and national insurance contributions alone. The bus is looked down on by many people who never use buses, including MP's, Local Authority workers and many local councillors. These discussions, prior to 'Buses and Economic Growth' report are vital in promoting the advantages of the bus and changing opinions about its importance. Thanks to Mike Willis for sending us the links.